“Speak! eyes — En zie! consists of poems made through Microsoft Word’s autosummary functionality. Fifteen existing works of literature, including for instance Hamlet, The Waste Land, and La Chartreuse de Parme, were autosummarized into new poems. The image above shows Vol. II of The Works by Edgar Allen Poe. Languages in the book are English, German, French and Dutch. See more images. You can read a discussion of the book in Matthew Kirschenbaum’s Track Changes, A Literary History of Word Processing, Harvard University Press, 2016. 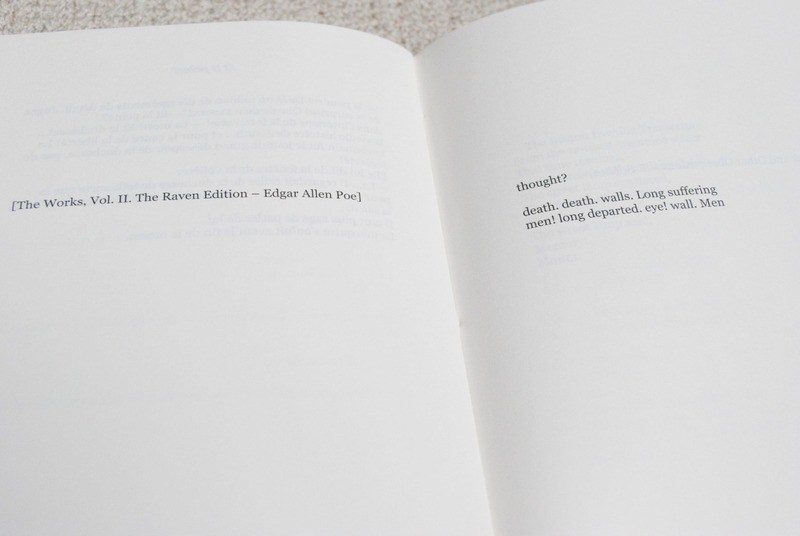 Also see a discussion of the work by Annette Gilbert in Reprint, Appropriation (&) Literature, Luxbooks, 2014. Published by Druksel, Gent, Belgium, 2010. The edition is limited to 126 signed copies, of which 100 books are numbered and 26 lettered. Offset print, 44 pages. Priced at 20 euro. Order by emailing johan [dot] velter [at] druksel [dot] be. The book is included in the collections of the Bayerische Staatsbibliothek, Columbia University, Erfgoedbibliotheek Hendrik Conscience in Antwerpen, de Openbare Bibliotheek Gent, Koninklijke Bibliotheek in Den Haag, Kunstbibliothek (Berlin), The Poetry Library in London, Yale University Library, Zeeuwse Bibliotheek, Zentralinstitut für Kunstgeschichte (Munich). [Tonnard is] turning Microsoft Word inside out, using its digitally native processes to make what is usually automated, derivative information – known as metadata – into a primary text for the reader’s attention. Matthew Kirschenbaum in Track Changes, A Literary History of Word Processing, Harvard University Press, 2016.